There are some actors who always seem to be working, and then there are those who are not only working, but somehow simultaneously doing four other things as well. 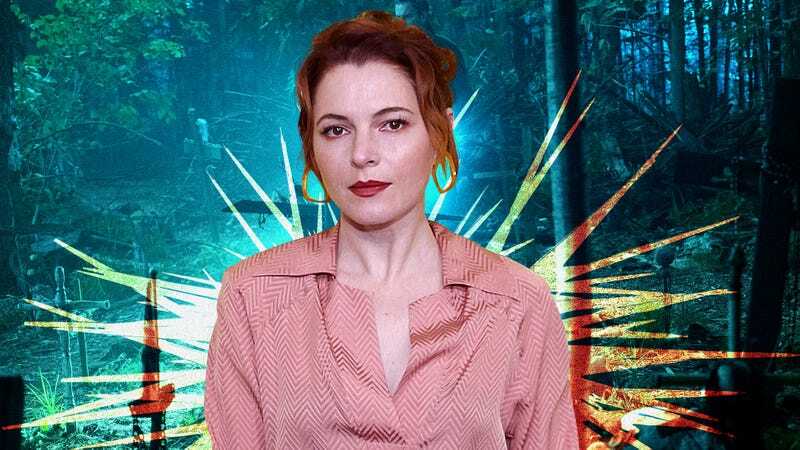 Amy Seimetz is in the latter category, a multi-hyphenate (actor, writer, director, producer, showrunner, to name a few) whose ability to wear many hats is a direct result of the micro-budget indie world she came up in, where making a movie meant doing a dozen different jobs on set. And she’s stuck to that mindset even after making the jump into more mainstream fare, which has put her in the enviable position of being able to pick and choose projects both in front of and behind the camera. With a string of acclaimed performances behind her (Upstream Color, Lean On Pete), a well-received feature directorial debut (Sun Don’t Shine), and memorable appearances in bigger-budget productions (Alien: Covenant, Stranger Things), she’s now coming off a two-season run as the co-creator and showrunner on Starz’s The Girlfriend Experience to star in the new adaptation of Stephen King’s Pet Sematary. The A.V. Club spoke with Seimetz on the eve of the movie’s release to discuss her fondness for horror, the recurring theme of grief in her work, and why it’s nice to be recognized as a weirdo. The A.V. Club: The world of horror is only one part of your resume, but you’ve taken part in such attention-getting projects that a lot of people know you from it—You’re Next, or Stranger Things, Alien: Covenant, and now this. Has the genre always held a special appeal for you, or is it just a matter of going where the interesting work is? Amy Seimetz: I love genre in general, and always have. As a kid, my parents were divorced, and when I would go to my dad’s, my sister and I were allowed to go to the horror section and pick out whatever we wanted, and we just spent the weekend watching horror movies. Even as a kid, I read R.L. Stine, Christopher Pike, and also Stephen King way too young. I’m incredibly nostalgic for it, but I also now, as an adult, find it to be a very interesting format to tell stories, and an interesting way to engage the audience in these “what if” questions. It’s a great format for storytelling, because you can explore these dark topics, but it doesn’t have to feel preachy. As a young filmmaker, I was very attracted to Buñuel and surrealists, and in a commercial format, it’s the closest thing you can get to surrealism. You have this language where the audience can stay with you through essentially an art film. It’s basically a massive art film, because you get to hit these weird tones and these surreal, almost absurd, circumstances. So for me, it’s just massively fun. Pet Sematary is essentially a family drama, the same way that The Shining is, but you can explore it in this very artful, surreal, and heightened platform. AVC: You’ve been familiar with the book from a very young age. Is there a different set of ideas or expectations that you bring to a role when it’s literally a character you’ve had in your head since you were a kid? AS: You don’t want to fail Stephen King. [Laughs.] And nobody wants to make a bad movie. So every film, you want to make it the best that you possibly can, no matter what movie it is. But it also became easier for me, because I’d lived with these emotions for so long. I read it when I was 8, and then I revisited it before the movie as an adult, and I found it was incredibly helpful to have that book, because his writing on the emotions of the characters is so on point, so it was an incredible resource to have for exploring it. And specifically with Rachel, there’s this incredible passage where she’s revealing to Lewis for the first time what it was like growing up with Zelda, and then the guilt that came when Zelda died, and it’s so accurate in terms of the portrayal of the emotions that you go through in grief, and the guilt that you feel. I just kept going back to that passage, because it’s so messy, and so exactly what I identified with, with losing my dad or friends that I’ve lost in the past. Grief is not just crying; you’re angry, you feel guilty, you’re maniacal, because sometimes you just have to laugh at the absurdity of it all. And that’s why in that passage, he really hits the nail on the head with the way that Rachel is dealing with grief. AS: I think that’s what’s so interesting about what we did in the movie, but also in the book: How do you explain that to a kid? Even as an adult, there’s a disconnect, having gone through the grieving...I say having gone through as if it’s in the past, but you just continually are going through the grieving process. It doesn’t go away. You just realize one day, “Oh, I have to keep living.” [Laughs.] You just carry that pain with you. I’m laughing at it, because you can’t cry about it all the time. It’s just a fact of life. People die. It’s just when. As a kid, the thing that was disturbing was, yes, the fact that I’m going to die, and my mom’s going to die, and my cat’s going to die, and everything’s going to die, and what does that mean? What is death? The interesting part is as an adult, I still am baffled by it. There’s still this disconnect between intellectually what you know and what your heart knows. They don’t align. Intellectually speaking, when I go home to Florida, I drive past my dad’s office, and I intellectually know, my dad is not in there, my dad is dead. But my heart is like, “What if you just go inside, and just check? Maybe he’s just been working this whole time.” [Laughs.] My brain is fighting it and going, “No, that’s crazy! You can’t walk into your dad’s office and go, ‘Where’s Michael Seimetz?’ That would make you crazy.” But that’s the thing, you can’t stop your emotions—intellectually, you can’t stop them. And I think that’s sort of why this movie and the book resonate so much with people and why it’s still relevant right now, is Stephen King did such a good job of talking about that, this concept of letting go. The heart’s a cunning beast; it tricks you. Your emotions trick you, sometimes control your intellectual thoughts, you know? AVC: It’s almost like you can mark the pivot point from being a kid to being an adult. What the book does so well is show death from both the kid’s perspective and the adult’s perspective to hook into that fear. As a kid, it’s like your fear is, “I’m going to die,” and as an adult, you’re like, “Oh wait, other people are going to die?” The horror sort of shifts. AS: Freud talks about this, how in order for society to function, we all have to have a healthy denial of death. If we all were thinking, “Everyone’s going to die!” it would just be panic all the time. So we walk around, and society functions because we deny death. Buildings get built because we’re denying death. I walk out the door because I deny death. I put an incredible amount of trust into human beings and also the way that society is functioning that I’m not going to walk out the door every day and get hit by a car. But I could. You have to turn that part of your brain off. So in order to be a part of society, you’re constantly denying death. And that’s why I like Stephen King. I don’t know if you read his book, On Writing, but he talks about going to the cinema when he was younger, and he was like, “I always loved these pulpy movies, something that was a little naughty and asked these bigger questions like, ‘What if you don’t behave correctly?’” What if your child dies? It’s so dark, and that’s why he shelved it. It’s exploring these things that you shouldn’t be doing because if you do it all the time, you can’t really function. And he’s just willing to go there. AVC: I feel like that’s the worst piece of advice: “Live each day as if it’s your last.” Nobody would do any of this everyday stuff if it was our last day on Earth. AS: I wrote a movie where it’s basically that: How do you live your last day? It’s crazy, the things that I go into. People are like, “Oh, I’d go be with loved ones, and sit there.” I actually wouldn’t, because I’d be sad the whole day. I’d just do a bunch of crazy stuff and I’d end up being a crazy person. But if it’s the last day, if I knew it was my last day, if you really think about it, what would you do? I think it would make you go kind of mad. AVC: Grief feeds so effectively into fear, to the point where in the film, it’s often hard to distinguish between the two. That’s a theme you’ve addressed in your own work, partially with The Girlfriend Experience, but also with Sun Don’t Shine. Is there something about how grief and fear intertwine to affect people’s behavior you find especially compelling? AS: I always like characters that have to cross a boundary. I’m from Florida, and I think people there are a little crazier than in the rest of the country; maybe it’s the heat and humidity, because how can you exist there and not be a little crazy? But I like when somebody has crossed some sort of threshold. In Sun Don’t Shine, it’s a woman who has killed her husband and there is no way, once you cross that boundary, to act sane. I just don’t think there is, once you’ve murdered somebody, once you’ve broken that social contract. Your next move, no matter what you do, is completely insane, whether it’s calling the police, you’re still going to be insane. You’ve crossed this threshold. And the same with The Girlfriend Experience. Once she’s made that decision to use her body as a commodity, once she’s crossed that threshold, it’s like, you’ve broken the social contract, or what we deem as the social contract, in family values or whatever. So I’m always fascinated with that. But having gone through my experience—I took care of my dad when he was ill, and then he passed away, and I was power of attorney, I was medical surrogate, and I was in charge of his healthcare—and for me, I would take my dad back. I’m not trying to bring him back like Pet Sematary, but I would take my dad back over any of this existential dread that I have. I would take him back any minute, but it’s definitely present in my performances, and also in my writing, it’s like this thing that I had to carry around for so long. I took care of him for three years, so this constant... my face was in death for like three years, and I didn’t know when he was going to die. So for me, it’s the ultimate. It’s hard to look at anything the same after you go through something like that. AS: There’s different things, and the lighter stuff is fun, but even with comedy, comedy is really just tragedy. And even in Pet Sematary, it’s funny, you’re laughing at people’s pain, and that’s kind of part of it. I laugh a lot when I bring up darker, fucked-up things, but that’s sort of part of it. I just respond to well-written stuff, or directors that are willing to go deeper into psychology. It’s very important in my work as a writer, so it becomes very important when I’m discussing with directors—it’s like, she’s not just a mom, what’s going on internally? What’s great now—and people are recognizing this, which is what’s great about what they did with Rachel in this movie—is in 2019, finally people are like, “Oh, moms have existential crises, and what makes them a great mom is that they’re constantly keeping at bay their own existential crisis.” It’s a struggle to be a good mom and not throw your own inner turmoil onto your child. That’s what makes you a good mom. AVC: You’ve talked before about the sorts of problems you’ll see recurring in women’s characters in screenplays and scripts. Is there a particular issue that drives you crazy when you see it in a badly written woman character? AS: It’s amazing that people still want to get into relationships, period, because everyone has their own crisis going on internally. I think that for me, that’s the really important aspect of portraying or writing these women characters—that for so long, what would piss me off is that the female character would just be servicing whatever existential crisis the male was going through, whether that would be a love interest, or the wife or the mother or whatever, but it was constantly just serving the male character. I always love women that make bad decisions, because at least you know that they’re struggling with something internally, that they’re not there to solve the problem or be there to comfort. It’s important to me that the woman is a living, breathing person and they have their own motives, and those motives are sometimes in conflict with the male character, just because that’s what life is like. AS: I’m very lucky. I’m extremely lucky. I work really hard, but I’m really lucky that I’m in a position where people actually care about something that I’ve written. I say that with anxiety, because I need to make a phone call because I’m late on a script. [Laughs.] But I’m extremely lucky to be in a position where I’m paid to write. But also independent film is so important to me, and creating stuff in a vacuum is so important. It’s just different. Whether you want to acknowledge it or not, when you write for television, or you write for—like, say, the script that is causing me anxiety right now—when you write for something that’s going to get distributed, you innately, when you approach it, you already know that you’re having a conversation with an audience, or that it will have an audience, and who that audience is going to be. You can play with that, you can play with that dialogue and you can subvert that expectation, because you know you have an audience. You know who the audience is. But I think in order for film to continue being relevant, it’s so important to have independent film where you’re writing in a vacuum, and you don’t know who the audience is. Because that’s the only way that new things come. And so I do preserve my time; I have all these things where I know there’s an audience, but I’m currently writing and making this thing where I don’t know. I don’t know where it’s going to go, but it’s a completely different emotion, and it’s a completely different attachment to the work. I find it actually exercises a totally different part of my brain, because there’s no expectation from it, and I’m able to just sort of make it for myself and explore something in complete earnest in this vacuum. You can make television and films that are earnest where you know who the audience is, but it’s just a different emotion, a different thing. But I think independent film is so important because that’s where new ideas come, and new perspectives, whether it be female or African American, you need that vacuum so that we can shape the way that cinema is. Look at Ryan Coogler: from Fruitvale to Black Panther. There would be no Black Panther if there was no Fruitvale. Same with Barry [Jenkins]. There would be no Beale Street without Medicine For Melancholy. AVC: You directed two episodes of Atlanta last year. You’ve done a lot of different gigs on other people’s films, and seen how they operate, but were there things that surprised you about the process of what is essentially directing another person’s vision? AS: So, Hiro [Murai] and Donald [Glover], I Skyped with them before they asked me to do it, and it’s honestly the only show that I had ever considered directing that wasn’t my own, and it’s because I think that’s the best show on television. I truly think it’s the most original and the best show on television, and I love their brains so much, Hiro and Donald and Stephen Glover, and Christian [Sprenger] the DP, I just think they created something so wildly different and interesting and weird and funny and dark and fearless. I’ve turned down a lot of director-for-hire gigs, and so the other reason I decided to do it is when they were Skyping with me, I was like, “Listen, you guys see the final product of what I do, but I’m letting you know that my process as a director is very... I’m a little looser. If a scene’s not working, whatever’s on the page, I change it. But that’s my own writing. So I just want to throw that out there, that I do this, and I don’t know if that’s okay with you. I don’t know if that’s how you work, and I don’t even know if that’s the correct way to work, because I write my own stuff and I have the freedom to do that.” And they were like, “No, that’s what we do all the time. It’s trial and error over here.” I’m like, “Great, we’re on the same page.” So that was the reason that I did it. But I loved them. Now they’re my friends, because we’re just a bunch of weirdos. When I was directing Donald on the “Helen” episode, and we were getting to know each other, I think I had first met him after I went to a women-in-film event, so I was all glammed up. But once we were on set, me and Donald were getting weird and talking about weird things, and he goes, “I just realized that you’re just a weirdo like me.” I go, “Did you think differently?” He’s like, “Well, the first time I met you, you were all glammed up and I was like, ‘Oh, she’s like a serious actress, and now we have to talk about serious things, and she directs this show The Girlfriend Experience, and so it’s very serious.’” I was like, “Really? That’s so weird, because we’re just goofballs, just a bunch of weirdos trying out these ideas.” It was just really funny. I appreciated it so much, because Donald’s so brilliant, but also it was just so lovely to be like, “Yeah, we’re just a bunch of weirdos, and we just want to see interesting work that pushes art forward.” It was a great experience for me. AS: Yeah! So Kate Sheil, who’s in Sun Don’t Shine and also the first season of The Girlfriend Experience, she and I always talk about my work as they’re secret comedies. They’re fluffed-up secret comedies. I’ve performed comedy, and I’ve been in comedies and stuff, but that’s definitely my sense of humor, and that’s another reason why I loved and directed Atlanta: It’s not a straight comedy. It’s bizarre. I don’t know if I could necessarily direct a straight comedy, because my sense of humor is just so dark, and I’m so in love with tone and anxiety, so directing a traditional comedy doesn’t really appeal to me because you can’t get away with some of the tone and the more artistic side of the things I like exploring—the experiential things, as opposed to hitting a joke, hitting a joke, hitting a joke. I guess it would be that I’m more attracted to the absurdity of things. But yeah, when Kate watched Sun Don’t Shine for the first time at South By Southwest in 2012, both of us were in the theater laughing. And people were like, “Why are they laughing?” I often tell people, you should watch it twice. Not for vanity purposes, but you should watch it twice, because once you get over the anxiety—because it is structured and crafted so that it is a pure anxiety ride—but once you get over that anxiety and the dread of what’s going to happen to these characters, you can rewatch it and watch it as a screwball comedy, a comedy of errors of these two people who are going nuts. It’s terrible, if you’re going through it, it’s terrible. From the outside, I just find people who are in pure panic to be wildly hilarious, because they can’t think straight, so it’s just a comedy of errors. It’s terrible, but it’s also wildly funny to me.